The RubyEncoder protects Ruby scripts by compiling Ruby source code into a bytecode format and this is followed by encryption. 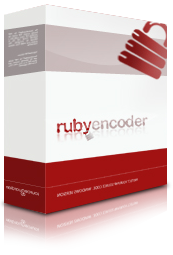 Simple, fast and reliable RubyEncoder encryption software. We have added "no GUI" packages for Linux for 32 and 64-bit. You may find these packages useful if you want to use RubyEncoder on a remote server which has no graphical user interface. Please find the README file included and read about manual registration of the command line encoder. New packages are available from the user account. © Copyright 2019 rubyencoder.com. All rights reserved.